It has been a year since the United States Preventative Services Task Force (USPSTF) released its Grade D recommendation against routine prostate-specific antigen (PSA) screening in men. In wake of the anniversary, the American Urological Association (AUA) released its own guideline for the “Early Detection of Prostate Cancer” at its 2013 Annual Meeting, which is currently ongoing in San Diego. Although I’m not at the AUA annual meeting, from my condo outside Washington, the guideline seems to have positive buzz at #AUA13 on Twitter. The AUA prostate cancer (CaP) dection guideline does a proper job of dispelling the broad recommendation against PSA screening and emphasizing that PSA testing is a shared decision between a patient and his physician. The emphasis on shared decision-making is strongest in men 55-69 years-old, where the European Randomized Study of screening for Prostate Cancer trial has shown the most impact at 11 years follow-up. But what does the guideline actually accomplish? For one—and I’d argue most importantly—it gives the AUA a clear voice on PSA for the early detection of CaP. For the past year, the AUA has “respectfully disagreed” with the the USPSTF recommendations, all the while having nothing to show for itself. The guideline draws a line in the sand between the AUA and the USPSTF. This is key. 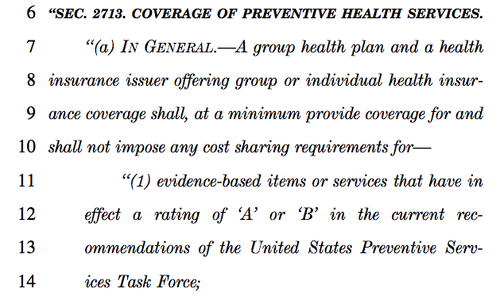 The ACA doesn’t prohibit health insurance exchanges from covering USPSTF recommendations Grade C and below. The ACA also doesn’t require the plans pay for low-grade USPSTF recommendations, either. The ACA strengthens the USPSTF and its recommendations. It’s unlikely health insurance exchanges will drop PSA testing in the future—there is simply too much political clout to lose over a relatively inexpensive test. But nothing is guaranteed in Washington unless it’s in writing. So, if you favor the AUA guideline, your next step should be to tell Congresswoman Marsha Blackburn (@marshablackburn) of Tennessee to reintroduce the USPSTF Transparency and Accountability Act of 2012. Then you should call your congressmen and tell them to support Blackburn. Then tell your colleagues to do the same. If you agree with the AUA, then your work isn’t done. Urologists, the AUA guideline gives you traction. The USPSTF Transparency and Accountability Act is the next move. Take it while you still have momentum. Christopher Bayne is a urology resident at The George Washington University. He keeps a blog called Urinalysis and Tweets at @CBayneMD.